Welcome! This page is a digital scrapbook of POINT BLANK sightings and reactions from readers and those at my readings. I'll be reading w/@authorKQ, @aking020881, @saidaagostini others-hope to see you in Baltimore! Shoutout to poet, @aking020881 for fielding some Qs from my students about his poem "Swarm"–which, if haven't read, I highly recommend it. Wonderful figurative language, relatable happenings, & perfect for elementary or middle school students to get them interested in poems. @aking020881 My students really enjoyed reading your poem “Swarm”. We created some hypothetical text conversations that may have taken place between some of the people in the poem & dove into some of your wonderful figurative language. Thanks for your work. What better way to spend a Saturday than with friends at @penfaulkner's Award Ceremony! Can you tell we’re super excited for An Evening of Poetry next week?! Join us on Thursday, April 26 at 7 pm and enjoy readings by local poets Alan King, Rueben Jackson, and Nancy K. Pearson! Join us for our Duende District x MahoganyBooks Pieces of Eight Workshop Series, hosted by poet Alan King. “A fixture on the D.C. MD VA scene since 1999, Alan has at one time blessed every Open Mic spot throughout the area. Mangoes, he was there; Brookland Cup Of Dreams, he was there. The “first” Java Head Cafe in College Park, he was there. The first Mocha Hut on 14th St, he was there. Yogi’s Records, he was there; Harambe’s in Adams Morgan, he was there. Teaism, he was there; and Bar Nun, he was there. This cat is a walking history book of D.C. poetry. Not only that, he’s a dynamic performer and prolific writer” — Derrick Weston Brown, poet-in-resident at the 14th and V streets Busboys and Poets. About the Workshop: Have Writer’s Block? Too often, writers find themselves in a space where the words won’t come, can’t come. There are other times where writers find themselves in a space where they are not satisfied with what they are writing, or even how the words are arriving to the page. 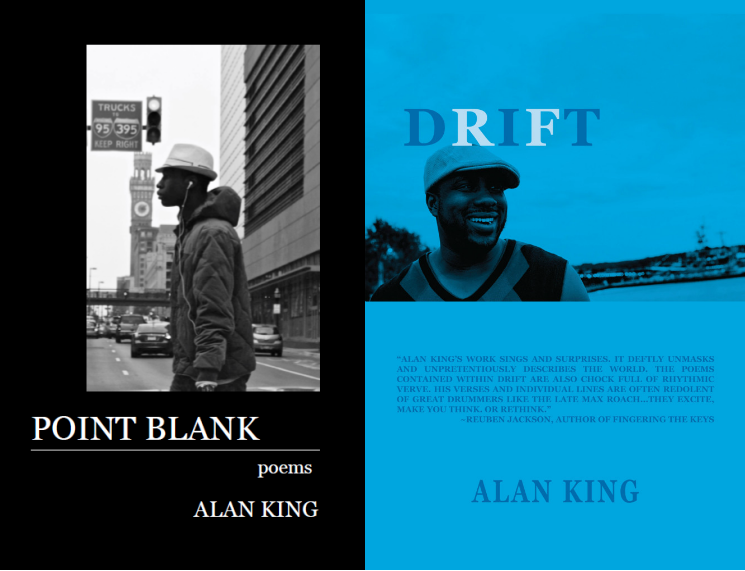 Poet and journalist Alan King will give you a few ways to jump start your creativity and generate new work. RSVP at mahoganybooks.com/blog About the Facilitator: Alan King is the author of POINT BLANK (Silver Birch Press, 2016) and DRIFT (Willow Books, 2012). King’s honors include fellowships from Cave Canem and Voices of Our Nations Arts (VONA) Foundation, three Pushcart Prize nominations as well as three nominations for Best of the Net selection. His poems and short stories appear in various literary journals, magazines and are featured on public radio. He’s a husband, father and communications professional who blogs about art and social issues at alanwking.com. A Cave Canem graduate fellow, he holds an MFA from the Stonecoast Program. I was just introduced to your work and I love it! Such a beautiful voice! Thank you @pennbookcenter for carrying POINT BLANK! Reposting Laura Shovan's Facebook post from Tuesday's reading at the Wilde Reading series. . . . Laura: Thanks to all who came out to our December event. LindaJoy Burke graced us with an open mic poem. Ann Bracken was host for the evening, and Alan King closed the reading with poems from his book Point Blank. More photos coming. Thanks to our other featured author, Doritt Carroll for her insightful, funny, dark poems. Happy to shutdown the #awp17 book fair with #BlackPoetsSpeakOut. Click the image to read the full review. My evening read tonight @awking020881. And really enjoying it. These poems are beautifully nostalgic and so relevant. Well done and congrats!